This is a wonderful combination of far future science fiction with Conan like sword and sorcery; lots of blood, gore, honor and evil. The immensely powerful hero, Tedric, is a man's man who refuses to accept the cruel human sacrifices demanded by the 'god' Sarpedion and is set on destroying him. To do this he needs some secrets of metallurgy that future social scientists are willing to give him. He manages to overcome all obstacles until of course he meets the dazzlingly lovely Lady Rhoaan who stops him cold. 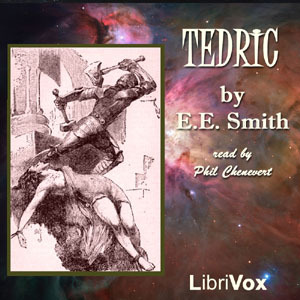 A great story written by the incomparable E. E. "Doc" Smith, author of the Lensman series. And there is a great sequel to this story which will be added to the catalog in the near future. It is called Lord Tedric.